Brockhill is very lucky to have a working farm as part of the beautiful school site. The Farm includes cattle, sheep, pigs, chickens, horses and small animals. All farmyard animals are reared to finished meat and are sold in our own Farm Shop. Our Farm Shop can be found next to the walled garden and is open on a Tuesday and Friday between 3 – 4.15pm. We have our Brilliant British Brockhill Bangers in stock at the moment – with new and much improved packaging. At Brockhill we are passionate about teaching students where food comes from, every year 7 and year 8 student has one lesson per week called the Great Outdoors (GO). In year 7 GO students learn about crop production and grow food to create a pizza, year 8 Go is based more upon farm animals and livestock meat production. Year 9 students can opt to take a level 2 Diploma in Animal Care which is followed by a double A Level Option in year 12 and 13 called Animal management. The school are very proud of our Young Farmers Club, members meet weekly on the school farm to learn about animal welfare, husbandry and show technique. We show our animals annually at the Kent County Show in July and at the Ashford Fatstock Show in December. Club members run public events including Lambing Day in the Spring and Carols with the Animals at Christmas. ….is a new initiative aimed at primary schools, Farming school consists of 6 main areas of study, which can be adapted to current topics. Each session is aimed at specific age groups and is curriculum linked; but can be adapted to suit other abilities/age groups where necessary. Moo & Make (KS1) ...looking at variation and species of farm animals, and how they have adapted for survival. Includes farm tour, introduction to animals and a craft session. Farmyard Finding (KS1) ...variation between and within species; along with the animals development over time. Includes farm tour and interaction with animals, worksheet based treasure hunt and classroom discussion. 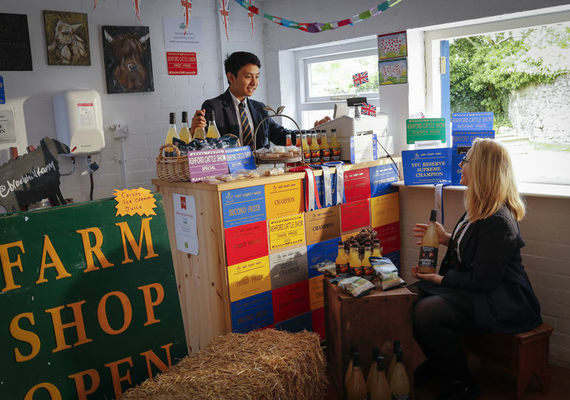 Farm to Fork (KS2) ...animal uses, main products, food groups, farm tour and discussion of each animal and main products, practical, quiz and conclusions, supporting British farmers and sustainability.